NORTH SYDNEY FAMILY HISTORY GROUP: MY ANCESTOR STOLE THE CROWN JEWELS OF ENGLAND WHAT HAVE YOUR ANCESTORS EVER DONE? MY ANCESTOR STOLE THE CROWN JEWELS OF ENGLAND WHAT HAVE YOUR ANCESTORS EVER DONE? My Grandfather’s Grandmother was Louisa Blood (1841-). Louisa Blood’s G G G G G Grandfather was Robert Blood whose great nephew was the notorious Thomas Blood (1618-1680) one of the most audacious rogues in history. His most outrageous act was, while disguised as a parson, stealing the Crown Jewels from the Tower of London in 1671. The most amazing part of this story is that not only did King Charles II pardon the rogue Thomas Blood for what he did he granted him Irish lands worth 500 pounds a year. Most of us have family stories that are handed down to us from past generations. They often define who we are. Our family were common people, our family were superior to others, our family were persecuted. It’s the stories of our ancestors that shape this in our minds often influencing our decisions in the present. But stories are stories. Even when all the facts are known and verifiable they can be interpreted in different ways. A subtle change in emphasis can completely change a story and its meaning. We live our lives within stories without fully appreciating just how fluid they really are. Many people grow up with an exciting story of a famous ancestor which is passed around the family from generation to generation. It’s a conversation starter; a colourful piece of our history. When we start our family history journey this is often the story that we want to research first. My family has a family tree drawn up in 1898 by Sidney York Sykes. It was given to my Great Grandfather Walter Guy Ball on a trip Sykes did from Edgbaston, Birmingham in 1902. Walter Ball would have been a member of the Art Students League of New York at the time. Sidney Sykes and my grandfather were first cousins. They were both young men. Sidney called the tree ‘Pedigree of the Bloods’. This is a bit of a treasure in my family and has been handed down over the years. The importance of genealogy to people of the upper classes back then was always to justify their privileges and as proof of their ‘racial purity’. My Great Grandfather, who designed stain glass windows for a living, would have been of the aspirational middle class. Always looking for how he could improve his social standing. I imagine the two young men would have had a lot of enjoyment discussing this family tree. There would have been a feeling of pride about their ancestry and interest in some of the stories contained within this tree, including that of the audacious rogue Thomas Blood. I have to confess that the exciting family story that we have been telling people for generations, that Thomas Blood is in our family tree, is not verifiable. We know now that the connection between the Anglo Irish Bloods (which include ‘the rogue’) and the Bloods of Tamworth, Staffordshire is dubious. I can’t claim Thomas Blood as one of my own. Sidney Sykes was a popular member of our family. 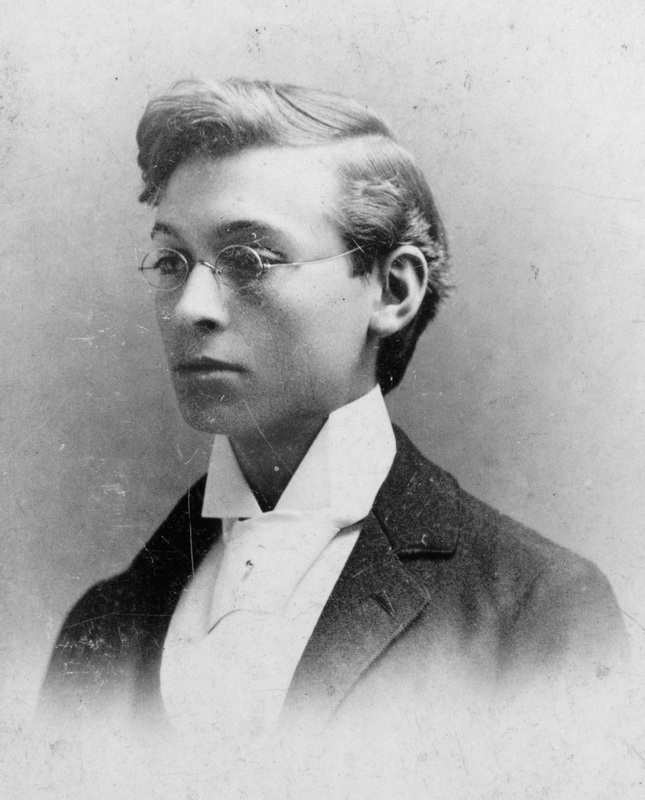 Shortly after visiting Walter Guy Ball he went on a trip to Maine where he committed suicide. Death came from a gunshot wound. I know how well loved he must have been because not only did my Great Grandfather name his first born son Sidney, 7 years after his cousin's death in 1909, but other members of the Sykes family named their sons Sidney as well. I have been in contact with distant relatives on the Sykes side of my tree, through the Ancestry.com website, who still have the first name Sidney. Sidney is a family first name that they have been using for generations, for men and for women. The ripple effects of the death of a loved one. 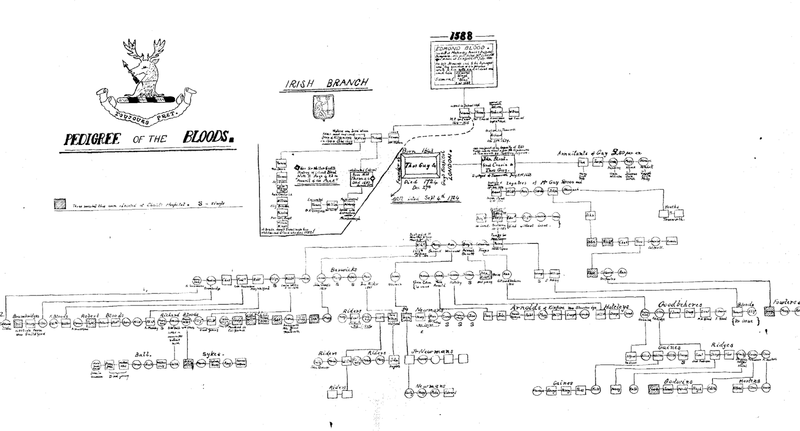 The Pedigree of the Bloods isn’t a completely inaccurate family tree. Walter Guy Ball gave his next child to be born, my grandfather, the same middle name that his mother had given him.. ‘Guy’. This name came from someone who is definitely in this tree; Sir Thomas Guy the founder of Guy’s hospital in London. 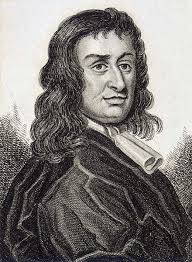 Sir Thomas Guy was the first cousin of my G G G G G G G Grandfather John Blood (1668-1744). 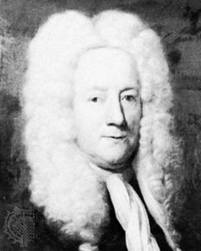 Not only was Sir Thomas Guy a better human being (nicer guy) than Thomas Blood he had a much cooler hairdo too. So now my family has a much more positive family story to tell. Sir Thomas Guy (1644-1724) came from a reasonably humble background but in his lifetime he amassed a fortune. He did this from his bookselling business and from stock market speculation. He famously sold all his shares before the South Sea Bubble burst (a famous stock market crash in London). 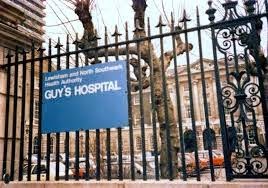 He was a parliamentarian and philanthropist who in 1721 founded Guy’s Hospital in London. When he died, never having married, his fortune was bequeathed to various people including his cousins. My ancestor John Blood received an annuity of a thousand pounds a year. I’m still waiting to see how much of that I’ll be inheriting. Pedigree for the aspirational middle classes and upper classes, back then, was very important. Whether or not the name ‘Guy’ was given to my Great Grandfather as a tribute to a philanthropic man or as a way of asserting a superior ancestry we’ll never know. Fortunately the interest in someone’s pedigree today has totally disappeared for everyone unless it’s for the British Royal Family or race horses or contemporary Rock and Roll musicians.